I've always thought, that you can make things as simple or as difficult as you wish. Me? I'd rather have them simple, whilst at the same time having a good working knowledge of the subject. Such is the case with the Knights Templar. What follows is brief history of those famous knights. If you want to know more, there are many excellent books on the subject. The Knights Templar were a French religious military order founded in Jerusalem in AD1119 by Hugues de Payens, to protect pilgrims travelling to the Holy Land. 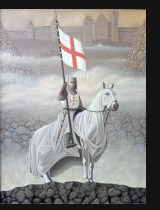 During the 12th and 13th centuries the Templars played an important role in the crusades sanctioned by Pope Innocent II who in AD1139 placed the Templars under direct papal authority. This holy brotherhood, or to give them their full designation, 'The Order of Poor Fellow-Soldiers of Christ and of the Temple of Solomon' (Pauperes commilitones Christi templique Salomonis) referring to their original headquarters on the site of the Temple of Solomon which was given to them by King Baldwin II of Jerusalem, lived under austere vows of poverty and chastity according to the rule of St Bernard of Clairvaux. They can be well described, as a band of fighting monks. The order comprised four ranks: servants, chaplains, sergeants, and knights, the latter wearing white surcoats with the red cross of St. George. It was in 1147 though, that Pope Eugenius III ordained them to bear the familiar eight pointed cross, which is said to be older in history, than the St George's cross. By the 13th century there were as many as 20,000 knights. .....and, in the following century or so, trouble was certainly 'a brewing'. Most of the countries of Europe were Christian in their beliefs, however the march of the Islamic faith began to infiltrate into the heart of most Christian lands (ring any bells ?). The Kings and landowners were happy in their belief in Christianity and didn't want to be taken over over by Islam or to have Islam have any say in the running of their countries affairs. The main problem was though, that most of these countries and lands, didn't have an army large enough or well equipped enough, to repel such foreign notions. Who better to help them out then, than the good old Knights Templars ? After all, they were the fighters for Christianity, that being the very task they were formed for; to protect against invasion of Christian beliefs. And, so it came to pass, that over the next century or so, the troubled Kings and landowners, hired the services of these formidable Knights to do that very thing, to protect the Christian way of life. In many ways, you can say the Knights Templar, were the first organised mercenaries ! And, it must be said, a task they were singularly successful at. Going into the 13th and 14th centuries, most of the wars had been won, Europe was virtually at peace and the once vast Knights Templar army, a mere fraction of it's former size. However, the Knights Templar were still very powerful, for they had become very rich. Origins & History - the Bankers of Europe. It was almost by accident that the Knights' became bankers. Over the years the order had acquired great wealth derived from payments for their services, plus gifts, from European kings and nobles. Feudalism and the ownership of land and estates throughout France, Spain and England also furnished them with many assets. Since the Knights had taken a vow of poverty they re-invested the money and lent. This brought about a superior banking system, the likes of which had never been seen before. Their holdings became extensive, both in Europe, the Middle East and for a time, the whole of Cyprus. In the times that followed, the Knights' become both trusted and feared. However, their success began to attract the concern of many other orders and eventually that of the nobility and monarchs of Europe as well. During this period, the nobility were seeking to monopolize control of money and banking after a long chaotic period in which the Church and its lay orders, had dominated financial activities. The Knight's had lent money to many of these monarchs, and along the way, paid for pilgrims to visit the Holy Land. However, not only did the Knights lend or give money out, they also refused. One such monarch, not known for his financial prudence, was King Philip IV of France. He had become somewhat disgruntled with his dealings with the Knights' and decided to do something about the situation. Enlisting the help of Pope Clement V, between 1307 to 1312, they began to suppress the order of the Knights', for they, it was decided, had become rather to big for their boots ! Eventually in 1312, under pressure from Philip, Pope Clement V disbanded the order. Mind you, legend has it, that as de Molay burned at the stake, he cursed both the Pope and King Philip, inviting them to join him in death within a year. And, in due prophecy of the curse, both did indeed oblige, the pope a month later and Philip following a few months afterwards. It just goes to show, you can't keep a good man down. After this bloody suppression, the assets and property of the Knights Templar were divided between their great rivals, the 'Knights Hospitallars' and various secular rulers throughout Europe, including England, where, King Edward II, handed much of the property over to the Knights of St. John. Incidentally, a descendent of the Knights Hospitallars are The St. John's Ambulance Brigade. You live and learn, don't you ?